Strawberries you will agree are liked by all. If not the flavor, then the color and curios dents on the fruit strikes another as fanciful. My children are not behind. They love it. Writing a food blog, you will agree, how we tend to say we love a lot of things with the danger of almost sounding monotonous. However, it’s true. We are all food lovers and enthusiast and go about tasting varied fruits and vegetables. I didn’t grow up with strawberry but the flavor is familiar through ice creams and preserves. Now, I enjoy the real deal. For my children growing up with an abundance of strawberries, it may not seem like a cultivar but something that sprang right up in their back yard. Human have cultivated most things and reengineering almost all food its scary and down right incredulous to most but I can’t help but say some of these cultivars seem like a blessing to me. Most certainly is strawberry. 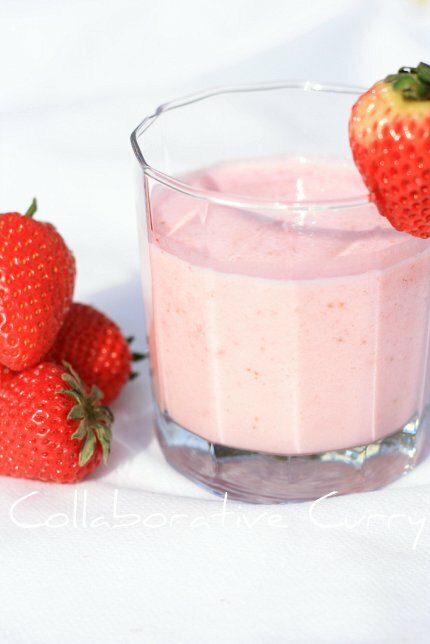 Here is a drink chock-full with strawberry. Throw in everything in a blender and blend until smooth.Serve, chilled. my fav drink..I do the same way adding 2 scoops of vanilla yogurt in addition! Lovely pictures as always. Beautiful..Beautiful click...i do make similar way..
Hey this is yummy.. looks delicious & interesting too ... Nice clicks!! lvely..nice clicks..i wudnt mind adding a scoop f icecream to it.. Enjoyed reading ur post... very nicely written. The clicks look as beautiful as ever!!!. hooohooo...We make it all the time, when strawberries are in season..three of us love only strawberries in shake..hehe...yummo...Namitha..
Lovely pictures! I love these too.Somehow blending this fruit rather eat it raw makes it more delicious! hey beautiful clicks..lovely refreshing drink..
refreshing n eye pleasing milk shake! Strawberry shake looks so inviting, and delicious.Beautiful clickas always. Very inviting... I m make it similarly! Awesomw clicks....I too make the same way :)...Yumm and refereshing. A very nice fruit cooler! a lovely, simple, refreshing drink and i have more superlative adjectives for your pics as usual...so wonderful...i make this one too! Adipoli as usual dears! Awesome as always. Are these shots are outdoor? Lovely clicks...and I just got 2 baskets of strawberries...will make this for sure now. Beautiful photos and a lovely post. I like your blog and will come back often. This is making me want to droooool!! Yum!! I can't believe it's so easy. I always put way too much in my smoothies! I did a little thank you to you in my blog with a link to yours if you want to check it out! Awesome clicks..looks like having that drink now. Can have this drink anytime, truly refreshing!! I just love this drink. Strawberry and mango are my favourites. You have a very beautiful blog. Keep on posting new items. I like to have a cup of this cold drink in hot weather here. Look really refreshing. Thanks for sharing. Most loved berry- strawb :) The first pict is gorgeous! Such a pretty pink and delicious strawberry drink! Wow soothing strawberry shake!! !Looks very refreshing and beautiful click. I can do with a glass of this now. Looks so nice and refreshing. Beautiful pictures! I love how simple and perfect this is! nice post i like strawberry milk. I love strawberry very much. Wonderful recipe. I will definitely prepare it. Looks yummy and mouth watering. A good dessert on a hot day! Cool and nice! I have bunch of strawberries sitting in my fridge. I am gonna try it. Very lovely clicks. This looks like it brings instant happiness. It's definitely ridiculous how often I say that I love things. But I mean it every time. You're right. I just love food. This drink sounds so good! Perfect to refresh you on a warm spring morning! Thats super easy and yummy! hi gulmohar, please collect ur award from blog dear! Sounds wonderfuly refreshing!The photos are stunning! Simply yummy! Lovely pink color n pretty pics! The summer is already in its peak here in India and this would be a perfect drink now(12.39 pm) ;).. This drink is just perfect & fresh! Gorgeous... Gorgeous... Gorgeous clicks here... Aaaaah, I feel in heaven!!! 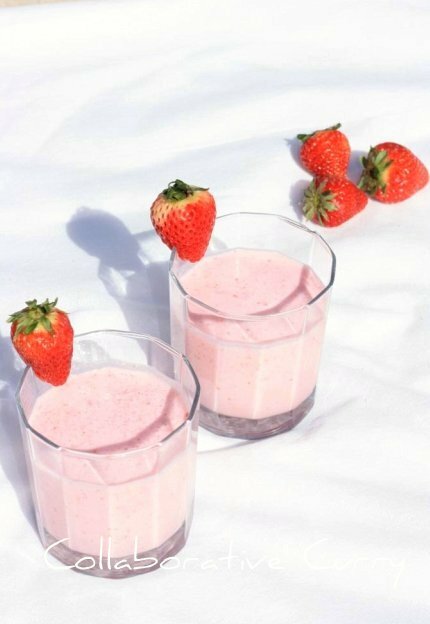 Nice pink colour..Strawberry is my fav flavour too..
what more is wonderful than relishing a refreshing drink made with the strawberries from our own garden, right? that's a wonderful thing Namitha!!! 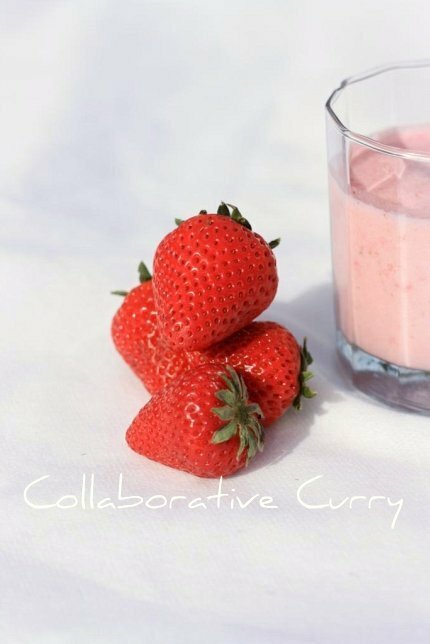 your strawberry shake looks delightful, creamy and perfect!!! just enjoy!!!! Lovely pink color, looks fantastic and yummy. I love strawberry flavour. This is liked by all at home.